A sustainable renovation and restoration project in Madison, Connecticut, brought the Sisters of Mercy the top prize in the Energy Efficiency and Conservation category in the 2012 Cool Congregations Challenge. The Sisters of Mercy recognized that their Mercy Center retreat facilities could no longer meet the Connecticut State Building Code. It could have meant the end of 40 years of retreat ministry, but the religious community chose to set a good example of sustainability to renovate and restore its aging buildings, as well as care for its 33-acre property on Long Island Sound. 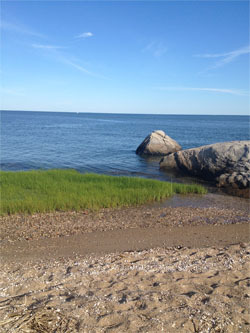 Like many coastal communities, Southern Connecticut has been dramatically affected by severe weather events, and the Sisters of Mercy view climate change as a major social justice concern. So they used their renovation as an opportunity to inspire others to reduce carbon consumption. They emphasized the reuse and recycling of building materials and required all contractors to follow rigorous guidelines for deconstruction, recycling, and integrated waste management. The project also included the renovation of Mercy Center’s main facility, the 1937 home of W.T. Grant designed by modernist architect Edward Durell Stone. Through the strategy of re-use/renovation, Mercy Center saved significant costs over constructing a new building, which would have been three times more expensive. Improvements included new EPA/DOE Energy Star-rated windows to save energy and heating/cooling expenses and new energy-efficient systems for heating and cooling the facility. Mercy Center has curbed energy use and reduced carbon dioxide emissions through energy abatement programs offered by Connecticut Light and Power, including energy audits and solar-powered hot water heaters that alone save 650 gallons of heating oil and 6.5 tons of carbon dioxide from the atmosphere per year. Other improvements include programmable thermostats, attic and wall insulation, low-flow toilets, and lighting upgrades. A new composting unit allows the center to transform kitchen scraps into fertilizer for a greenhouse and garden where Mercy Center grows food for its guests. The center also took care to preserve the natural habitats surrounding its facilities. A team from the Yale School of Forestry and Environmental Studies helped inventory 256 landscape trees to ensure each of the 45 represented species will receive proper care. The center also chose an accredited organic land care professional to care for its lawns in compliance with the organic lawn care program offered by the Connecticut chapter of the Northeast Organic Farming Association.